This Hayward Power-Flo LX Above Ground Pump is yet another Hayward high-performance pump designed and engineered for above ground pools. With a heavy-duty motor and thick-walled construction, the Power-Flo LX gives you dependable use with whisper quiet operation. The long-lasting anti-corrosion materials and technologically advanced options make this a prime choice for your pool filter system! Above ground pools are a great option for families and people who either cannot afford a built-in pool or just don't have the space. It's overwhelming to learn all about the kinds of pools and types, maintenance requirements, how to set the pool up, where to set it up, and what filter and pump to choose. The pump is the drive that runs your system and is the core of your pool's filtration. We want to help you make the right choice when you look to buy the best above ground pool pump. Read on to learn about the options and pumps available! 8.5" x 10" x 22.5"
13.8" x 18.5" x 16"
17" x 9.5" x 14.5"
27.2" x 15" x 14.3"
The Hayward Flo LX Series above ground pool pumps help you to enjoy your pool by keeping maintenance to a minimum! This model provides a 100-percent drip proof and heat resistant seal so the motor is protected and lasts longer and its self-lubricating motor bearings and shaft seals add to long-lasting operation. The 1-1/2-horsepower motor is made with a thermal overload protection system so the motor will automatically shut off if it detects high temperature levels. It will start on its own once the temperature is back to normal. A large debris basket has a clear cover made of strong and break-proof PermaGlass XL material so you can see when it's full and it catches dirt and bugs, keeping your motor safe from blockages. This powerful pump can take on heavy loads of pool debris and still pump water without any reduction in suction. Winterizing is easy and with all the additional features, you won't need to replace this pump for years to come! Several customers reported having to replace the pump bearings sooner than expected. 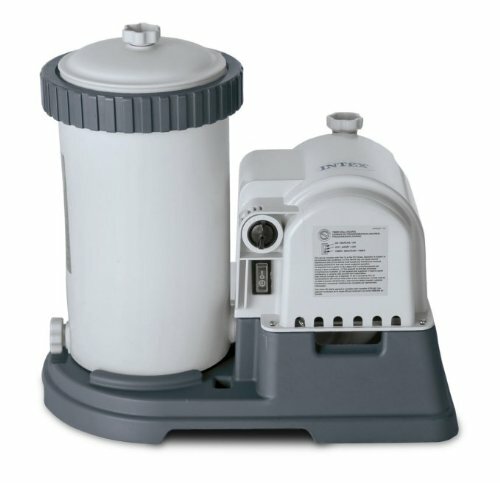 Hayward maintains their reputation for technologically advanced pool pumps with this Super Pump large capacity model. A balanced Noryl impeller allows for a balanced operation and higher water flow rates with less horsepower requirements. You can save on electricity and run this pump less than other brands. The debris collection basket is super-sized at 110 cubic inches so you won't have to clean it out as often. It traps leaves and prevents blockage in your motor. Hayward designed this pump with swing-aside hand knobs so the strainer cover is easier to remove and the cover is see-through plastic so you can see when it needs to be emptied. Hayward uses corrosion-proof materials for long lasting use and trouble-free operation for years. As with Hayward products, this large capacity pump has a premium manufactured housing with full-flow ports for fast priming and smooth operation. The Hayward Super Pump is efficient, dependable, and runs quiet! The Intex Krystal Clear Cartridge Filter Pump is a 2,500 GPH pump. It moves the water in your pool with its powerful circulation to keep your water clean and clear. With a filter cartridge system, you can either rinse the filter or replace it after it seems worn to keep the pump running at its best capacity. This pump is Intex's most powerful pool pump, and works perfectly for an above ground pool up to 24 feet in diameter. It features a built-in timer so you can set the run times according to your pool size and water volume in increments of 2 to 12 hour cycles. There's an air release valve to release air trapped in the filter chamber and a flush valve for sediment. The pump is double insulated for durability and is easy to setup. Intex includes a Hydro Aeration Technology inlet fitting. This pump works great with your Intex pool or any other brand backyard pool! Zodiac manufactures this 60-hertz motor pool pump for durability, energy efficiency, and high performance. 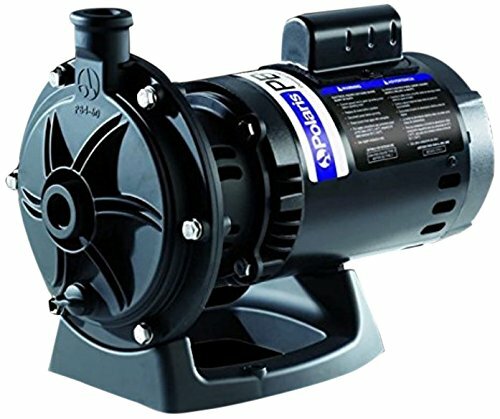 The extremely low water flow requirements enable this pool pump to operate at a lower speed than other pumps, saving energy and pump life. It runs at either low-speed or a 2-speed operation. 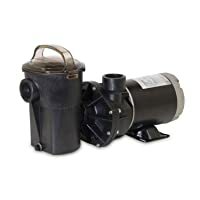 The Polaris booster pumps like this Zodiac PB4-60 are designed to run Polaris's pressure-side cleaners and that extra power also makes a superior pool pump. 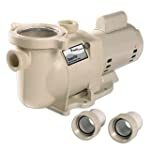 This pump is compact and built with superior materials for long-lasting and quiet operation. This is a tough pump and is made for easy pump seal replacement and captured back plate nut fasteners' so servicing it is convenient and easy to access. This is a great value and outstanding product! Several customers had a problem with the motor making noise and needing to be replaced. SuperFlo Pumps has been producing highly superior engineered hydraulics for almost 50 years. Their pumps move more water in less time to help keep your pool water pristine. This efficiency allows for longer pump life and quieter operation. This single speed pump has a 2-horsepower motor is designed and powered for an in-ground pool but can be used for above ground pools and spas. SuperFlo manufactures this pump with thick walls and a 56 square flange motor with heavy duty hydraulics. It is energy efficient and easy to install and made with high quality materials to withstand harsh conditions. The self-priming feature allows for a fast start up and all SuperFlo pumps undergo performance and pressure testing at the factory. Buy with confidence and enjoy the performance and quiet operation of this SuperFlo pump. Pool owners complained about the life of the motor being too short. A pool needs the water to be filtered and the two main components of the filtering system are the filter and the pump. The pump contains the motor that drives the pressure to circulate the water from the pool, through intake hoses or pipes, through the filter that either has sand, cartridges or other material, and then back out to the outlet valve to distribute it back into the pool. The filter traps dirt, debris, bugs, grass, and other elements you don't want in the water. These cause algae and bacteria to build up. The size and power of the pump you purchase for your above ground pool will depend on the size of your pool and the options you want. Here are some of the considerations when purchasing a pool water pump. The average backyard pool only required a single speed pump. It runs on either 220 or 120 standard service voltage and turns off and on—no special speed settings needed. A two-speed pump has a normal mode and a high-speed operation changed with a toggle switch. These water pumps are made more for commercial use. Variable speed pool pumps are useful if you want to change the speed often to either match the pool conditions or to save money on your electric bill. For the average above ground pool, the single-speed pump is all you need. The size of the pump will be determined by the size of your pool. If you purchase a pool pump much more powerful than what you need, you'll use more electricity than needed resulting in a higher cost for summertime fun! Instead of complicated charts ad calculations, there's an easier rule of thumb. The horsepower of the pump's motor follows a simple rule: an above ground pool that is 'up to' 24 feet around would do fine with a 1 HP pump. Any pool over 24 feet around requires a 1.5 HP pump. If your motor is too powerful, the water may be filtered too fast through the system and not clean and sanitize the water properly. For oval above ground pools, use the same measurement for the length of the pool and choose the HP based on that. When considering a pool filtration pump, look for options that provide energy efficiency. The pump makes up 70% of the cost to run your pool so the more features that provide energy saving, the better the value and less electric costs you'll have. Be sure the energy saving options are not a smaller HP or cheaper materials. Pumps with thicker walls and better seals will save energy. Our TOP PICK, the Hayward SP1580X15 Power-Flo LX Series 1-1/2-Horsepower Above-Ground Pool Pump provides powerful filtering and energy saving features. You want to choose a pool pump that is easy to use and easy to repair if needed. The size of the basket and skimmer for trapping dirt and debris before it get to the filter is important if you have a lot of trees near your pool or a lot of swimmers tracking in grass and dirt. 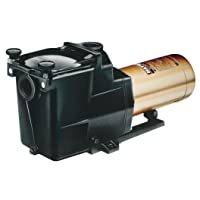 There should be access to components so repairs take less time and cost less money like the Hayward SP2610X15 Super Pump 1.5 HP Pool Pump with an easy-open skimmer and the Zodiac PB4-60 Polaris Booster Pump with 60-Hertz Motor with easy access back plate nut fasteners. Fun in the sun means a summer filled with good memories and with a backyard above ground pool, you can keep your family entertained on those hot, dreary days. Pools provide a cooling off activities, great exercise, a chance for family bonding, and makes a great feature for birthday parties and summer barbecues. We hope this article provided great information and aided you in understanding the needs of your pool and filter so you can buy the most efficient and the best above ground pool pump!